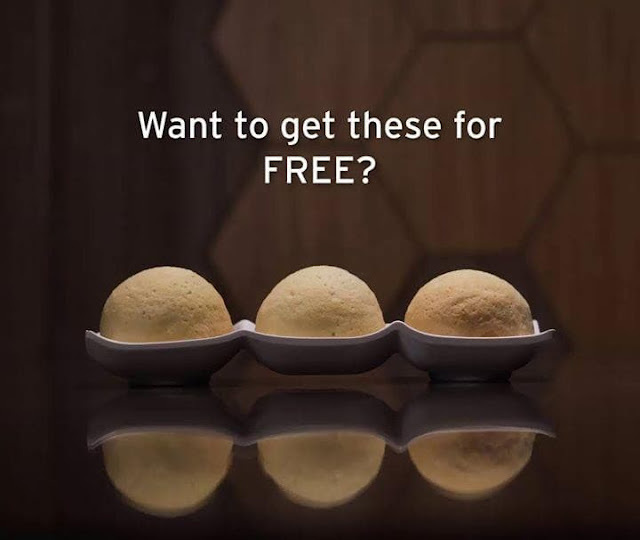 The Citibank – TIM HO WAN Dining Promotion (“Promo”) is open to all Citibank Cardholders (“Cardholder”), whose credit or debit cards (“Cards”) have been issued by Citibank, N.A., are active and in good credit standing. To avail of the Promo, the Cardholder must use his/her valid Card to pay for his/her single-receipt bill (inclusive of VAT, service charges, and prevailing local taxes) at Tim Ho Wan. The Promo is not valid on all legal and declared holidays. The Promo cannot be used in conjunction with other promotional offers, privileges or VIP cards. Discounts and privileges are not exchangeable for or convertible to cash, credit or other goods and services nor allowed as payment for the Card dues. The Promo is applicable for dine-in transactions only. The general terms and conditions of Tim Ho Wan apply. Per DTI-FTEB Permit No. 1568, Series of 2018. 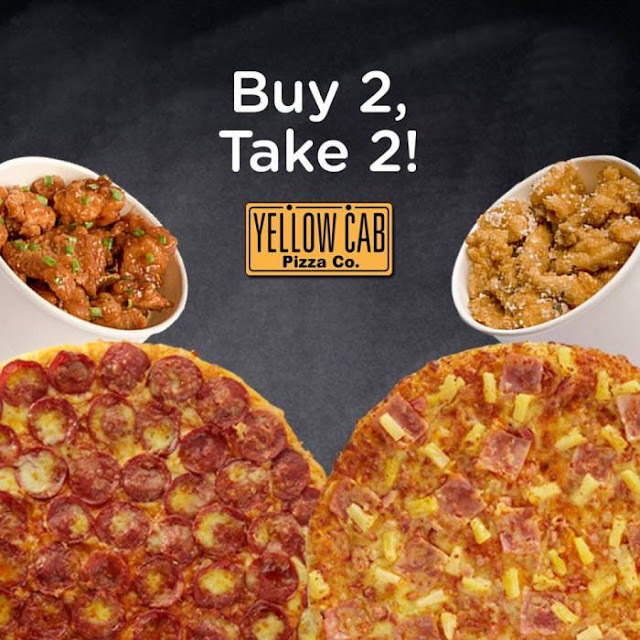 Promo Alert: Buy 2, Take 2 at Yellow Cab! The promo is open to all active Principal and Supplementary cardholders of BDO Mastercard, Visa and BDO Debit Cards (collectively, "BDO Cardholder"). Promo runs from April 20 to May 20, 2018. Offer is available daily and applicable to dine-in and take-out transactions only. To avail of the promo, BDO Cardholder must charge the total amount of purchase to his/her qualified BDO Card. Offer may be availed once per Cardholder, per visit. Only one qualified BDO Card may be used per visit even if he/she has more than one qualified BDO Card. Splitting of a single transaction for the purpose of availing multiple discounts is prohibited. The promo is valid for single-receipt transactions only. Offer cannot be used in special/banquet events and is not convertible to cash. The offer cannot be exchanged for other items or discounts and cannot be used in conjunction with other promotional offers by Yellow Cab. In the purchase of good and services which are on the promotional discount, the Senior Citizen and Person with Disability can avail of the promotional discount or the discount provided under the expanded Senior Citizens Act of 2010 or Magna Carta for Persons with Disability, whichever is higher. Per DTI-FTEB Permit No. 6027, Series of 2018. 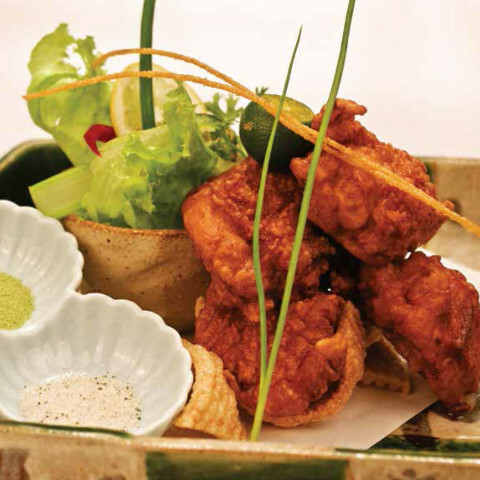 Promo Alert: FREE Karaage Fried Chicken at Mangetsu! The promo is open to all active Principal and Supplementary cardholders of BDO Credit and Debit Cards, BDO issued American Express Cards, Diners Club Card (collectively, “BDO Cardholder”). Promo runs from November 3, 2017 – May 31, 2018. Offer is available daily and applicable to dine-in and take-out transactions. To avail of the promo, BDO Cardholder must charge the total amount of purchase to his/her BDO or American Express Credit Card, Diners Club Card or BDO Debit Card. Only one qualified BDO Card may be used per single-receipt transaction, or per table and only one qualified BDO Card will be accepted per Cardholder per visit even if he/she has more than one qualified BDO Card. Splitting of a single transaction for the purpose of availing multiple discount is prohibited. The promo is valid for single-receipt transactions only. Offers cannot be used in conjunction with other promotional offers, in-store sale or discounts, privileges, and VIP cards. Offers are not convertible to cash. The offer cannot be exchanged for other items or discounts and cannot be used in conjunction with other promotional offers by the partner merchant. In the purchase of good and services which are on the promotional discount, the Senior Citizen and Person with Disability can avail of the promotional discount or the discount provided under the expanded Senior Citizens Act of 2010 or Magna Carta for Persons with Disability, whichever is higher. This promo cannot be availed with other ongoing promotion and offers of BDO. Here’s a burger you don’t see everyday! Cook up this unique recipe! 1. Prepare the Black Bean Burger: Set aside ½ cup black beans. In a food processor, pulse remaining black beans, mushrooms, shallots, jalapeño peppers, barbecue sauce, TABASCO® Chipotle Sauce, ancho or chile powder and cumin until a chunky purée forms. 2. Transfer purée to a medium bowl and mix in oats, rice, egg white and reserved beans; season with salt and pepper. Form mixture into 4 patties about ½-inch-thick, cover and chill for 1 hour. 3. Heat a pan to medium-high; add a touch of olive oil and sear patties on both sides until crisp. 4. Prepare the Rajas: Preheat oven to 450°F or heat a broiler, charcoal grill to medium-high or gas grill to high. 5. For the oven or broiler, mix peppers, oil, salt and pepper in a large bowl; place on a rimmed baking sheet. For a grill, oil grill grate and place peppers directly atop. Roast 15 to 20 minutes, turning occasionally, until tender and charred. Transfer to a large bowl, cover with plastic wrap and let steam for 15 minutes. Peel peppers and slice in half; discard seeds and slice crosswise into ¼-inch strips. 6. Prepare the Corn Relish: In a bowl, combine all ingredients and season with black pepper. 7. Toast buns on the grill or oven. 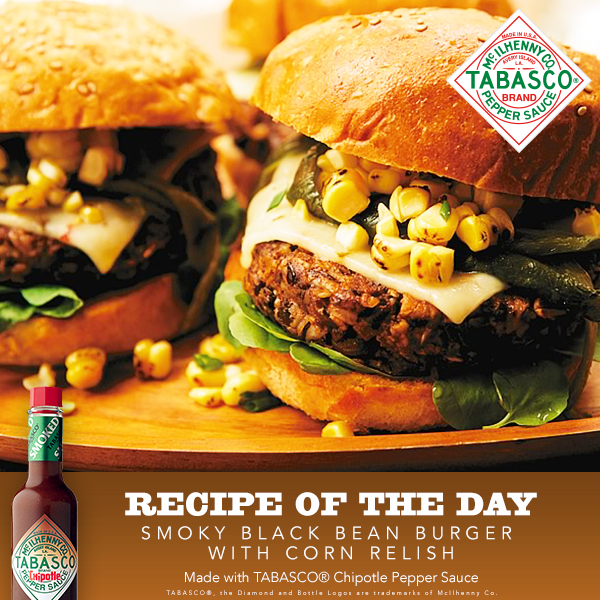 Place each Black Bean Burger patty on a bun and top with cheese, roasted Rajas and Corn Relish. 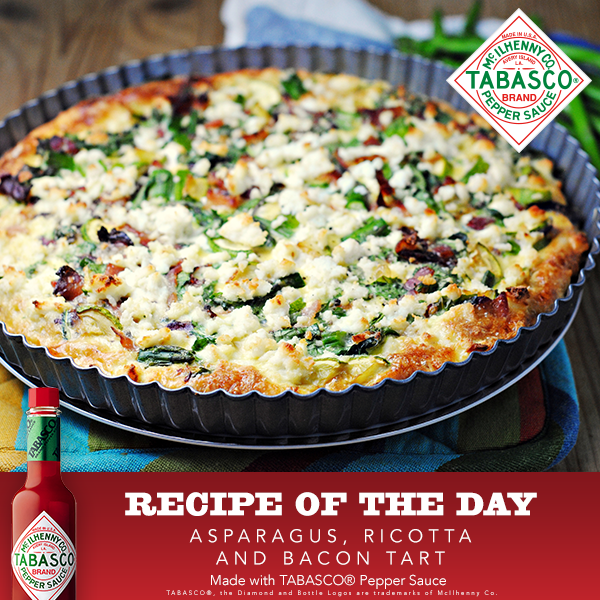 Sink your teeth into this deliciously spicy Asparagus, Ricotta and Bacon Tart! 1. Roll dough out on floured surface to 12-inch round. Transfer to 10-inch diameter tart pan with 1-inch sides and removable bottom. 2. Press dough onto bottom and up sides of pan. Trim edges. Refrigerate 30 minutes. 4. Line pastry with foil. Bake 10 minutes. Remove foil; cool on wire rack. Reduce oven temperature to 375°F. 5. For filling, fry bacon in large skillet until crisp. Transfer to paper towels; drain. When drained, coarsely chop bacon. Heat water (salted) to boiling in large saucepan. Add asparagus; cook 3 minutes or until crisp tender. Drain; transfer to bowl of ice water to cool. Whisk together eggs, ricotta, TABASCO® Sauce, salt and curry powder in large bowl. Stir in bacon, asparagus and scallions. 6. Pour filling into prepared crust. Sprinkle with Parmesan cheese. Bake 35 minutes or until filling is slightly puffed and firm. Cool on wire rack 5 minutes. Remove pan sides; cut into wedges. 7. 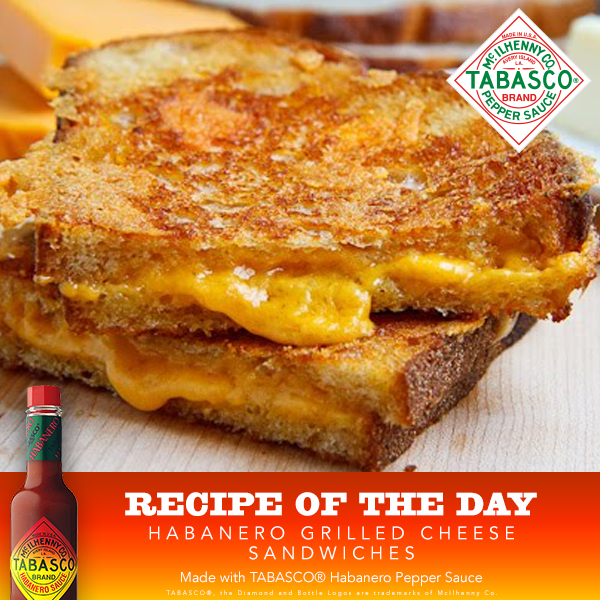 Serve warm or at room temperature..
Add a fiery touch to the classic grilled cheese sandwich by adding a few drops of TABASCO® Habanero Sauce! 1. Combine butter, TABASCO® Habanero Sauce, and salt in a small bowl and mix well; set aside. Divide cheese equally among 4 pieces of the bread and top with remaining bread slices. 2. Brush sandwich tops with butter mixture and place butter-side-down in a large skillet over medium-low heat. Brush tops with remaining butter and cook until golden, about 4 minutes. 3. Flip sandwiches over, and cook until golden brown, about 4 minutes more. Serve hot. Craving for meat? We’ve got just the recipe for you! 1. Combine TABASCO® Chipotle Sauce, oil, salt and pepper in medium bowl. Mix well. Rub flank steak with mixture. Cover and refrigerate for 1 hour. 2. Combine red onions, rice wine vinegar, salt and sugar in medium bowl. Mix well. Set aside. 4. Place peach halves on grill; cook 3 minutes, until just softened. Set aside 3 grilled peach halves for garnish. 5. Place remaining peach halves in blender with ketchup, TABASCO® Chipotle Sauce, Worcestershire sauce, honey, paprika and garlic powder; blend until smooth. 6. Transfer to a pot and bring to a boil over high heat; reduce heat to low. Simmer uncovered, 15 minutes, stirring occasionally. 7. Grill flank steak 3 minutes on each side. 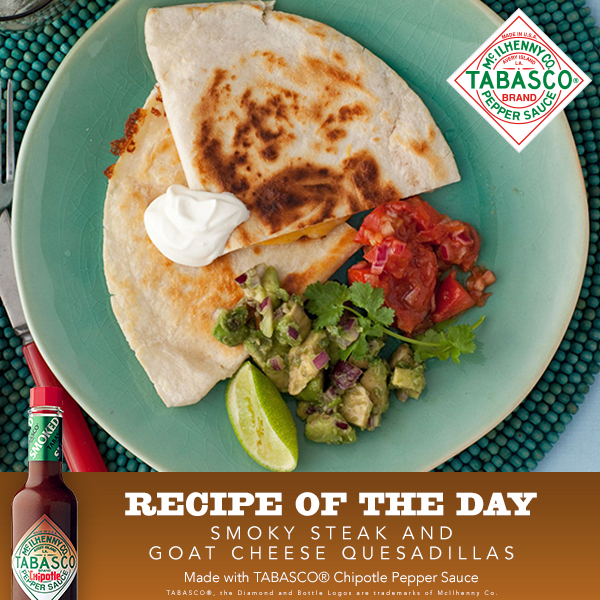 Brush with TABASCO® BBQ sauce; grill 1 to 2 more minutes. Let rest 5 minutes before slicing. 8. 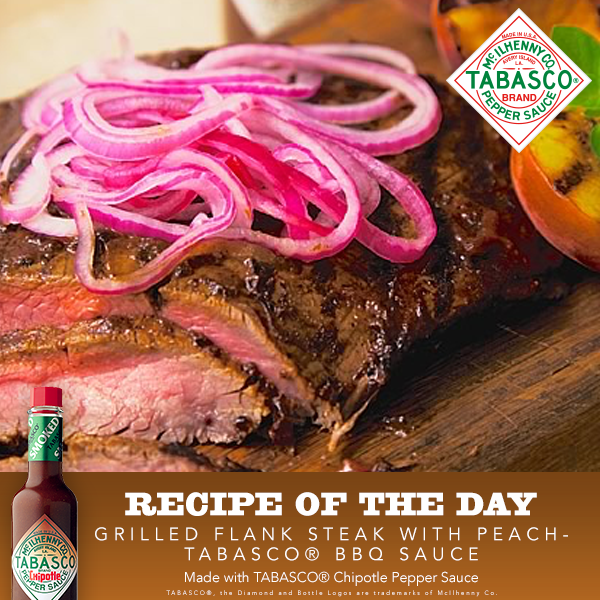 Garnish flank steak with reserved grilled peach halves and serve with pickled red onions. Thinly slice flank steak across the grain.